SNYDER & LEMIRE'S AD: AFTER DEATH HEADED TO THE BIG SCREEN! Writer Scott Snyder and Illustrator Jeff Lemire's A.D.: AFTER DEATH, a three-part epic series published by Image Comics, has been acquired by Sony in a significant deal in a multi-party bidding war, to be developed into a feature film. Snyder and Lemire will serve as Executive Producers on the project. A.D. is set in a future where a genetic cure for death has been found. One man, years after the discovery of the cure, starts to question everything, leading him on a mind-bending journey that will bring him face-to-face with his past and his own mortality. A.D. is the first project Snyder and Lemire, longtime friends and both acclaimed and bestselling comic creators in their own right, have worked on together. 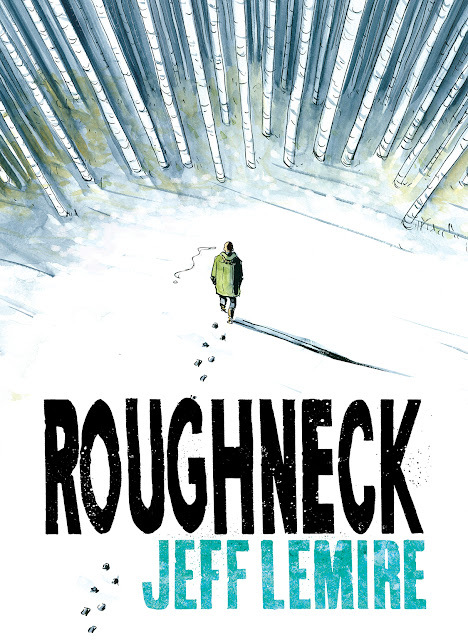 This is the first project Lemire has illustrated that he has not also written. Book 1 was published November 2016, with Book 2 available December 21, 2016. Josh Bratman of Immersive Pictures will work alongside Eric Fineman at Columbia to produce the film. Bratman is also developing Jeff Lemire and Dustin Nguyen's comic series DESCENDER into a feature film franchise. Scott Snyder is a New York Times bestselling author and an Eisner and Harvey Award winning writer (AMERICAN VAMPIRE with Stephen King, SWAMP THING, BATMAN).WYTCHES, his creator-owned Image graphic novel series with illustrator Jock, is under option at New Regency with Plan B producing. Scott is currently on an overall deal with DC Comics. Jeff Lemire is a New York Times bestselling author and the creator of the acclaimed graphic novels SWEET TOOTH, ESSEX COUNTY, THE UNDERWATER WELDER, and TRILLIUM. 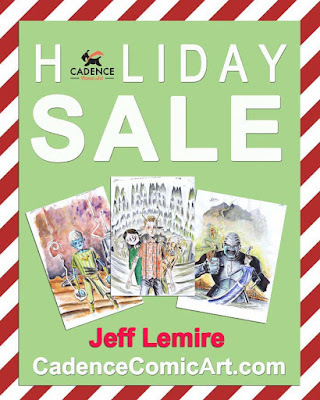 Jeff is a prominent writer for DC Comics and Marvel Comics where he currently writes the monthly adventures of THE X-MEN and MOON KNIGHT. The rights to Jeff Lemire and Emi Lenox's PLUTONA have been acquired by Ken Kao to produce as a feature film. Lemire's graphic novel trilogy ESSEX COUNTY is under option to Canadian production company First Generation Films with Christina Piovesan producing as a TV series. The deal for A.D.: AFTER DEATH was brokered by Angela Cheng Caplan of Cheng Caplan Company, Inc., along with Lemire's attorney Allison Binder of Stone, Genow, Smelkinson, Binder & Christopher, LLP and Snyder's attorney Lillian Laserson of Laserson Law. From the New York Times bestselling author and award-winning creator of Secret Path, Essex County, and The Underwater Welder comes an all-original graphic novel about a brother and sister who must come together after years apart to face the disturbing history that has cursed their family. Derek Ouellette’s glory days are behind him. His hockey career ended a decade earlier in a violent incident on ice, and since then he’s been living off his reputation in the remote northern community where he grew up, drinking too much and fighting anyone who crosses him. When his long-lost sister Beth shows up, on the run from an abusive boyfriend, the two escape to a secluded hunting camp in the woods. There, living off the land, they reconnect with each other, the painful secrets of their past, and their Cree heritage...and start to heal. But Beth’s ex-boyfriend is hunting them. As he circles closer, he threatens to shatter this newfound peace and pull both Derek and Beth back into the world of self-destruction they’ve fought so hard to leave behind. Touching and harrowing, this is a deeply moving and beautifully illustrated story about family, heritage, and breaking the cycle of violence. 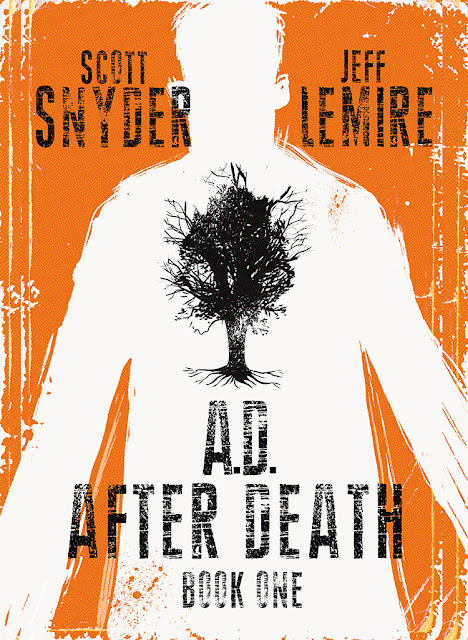 WHAT PEOPLE ARE SAYING ABOUT A.D.
SNYDER/LEMIRE AD: AFTER DEATH OUT NOVEMBER 23! Chanie, misnamed Charlie by his teachers, was a young boy who died on October 22, 1966, walking the railroad tracks, trying to escape from the Cecilia Jeffrey Indian Residential School to walk home. Chanie’s home was 400 miles away. He didn’t know that. He didn’t know where it was, nor how to find it, but, like so many kids - more than anyone will be able to imagine - he tried. I never knew Chanie, but I will always love him. Chanie haunts me. His story is Canada’s story. This is about Canada. We are not the country we thought we were. History will be re-written. We are all accountable, but this begins in the late 1800s and goes to 1996. “White” Canada knew – on somebody’s purpose – nothing about this. We weren’t taught it in school; it was hardly ever mentioned. All of those Governments, and all of those Churches, for all of those years, misused themselves. They hurt many children. They broke up many families. They erased entire communities. It will take seven generations to fix this. Seven. Seven is not arbitrary. This is far from over. Things up north have never been harder. Canada is not Canada. We are not the country we think we are. The stories Gord’s poems tell were fleshed into the ten songs of Secret Path with producers Kevin Drew and Dave Hamelin. Recording took place over two sessions at The Bathouse Recording Studios in Bath, Ontario, November and December 2013. The music features Downie on vocals and guitars, with Drew and Hamelin playing all other instruments. Guest musicians include Charles Spearin (bass), Ohad Benchetrit (lap steel/guitar), Kevin Hearn (piano), and Dave “Billy Ray” Koster (drums). 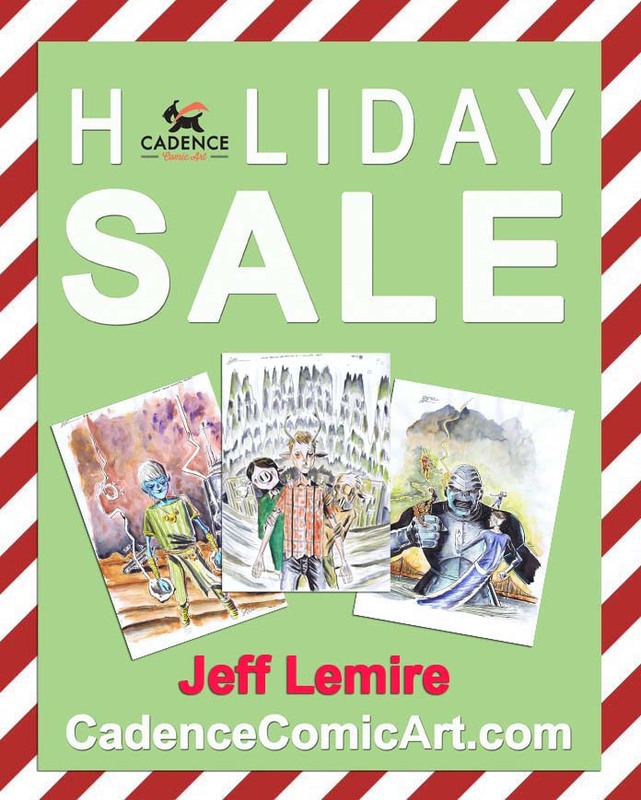 In winter 2014, Gord and Mike brought the recently finished Secret Path music to graphic novelist Jeff Lemire for his help illustrating Chanie Wenjack’s story, bringing him and the many children like him to life. The ten song album will be released by Arts & Crafts accompanied by Lemire's eighty-eight page graphic novel published by Simon & Schuster Canada. Secret Path will arrive on October 18, 2016, in a deluxe vinyl and book edition, and as a book with album download. Downie’s music and Lemire’s illustrations have inspired The Secret Path, an animated film to be broadcast by CBC in an hour-long television special on Sunday, October 23, 2016, 9pm east. 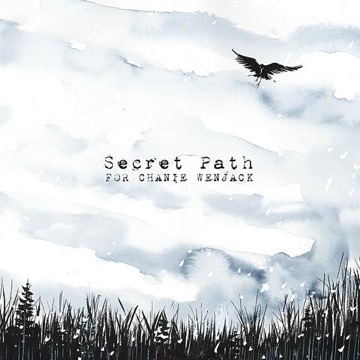 The Secret Path is produced by eOne and Antica Productions Ltd. in association with CBC. 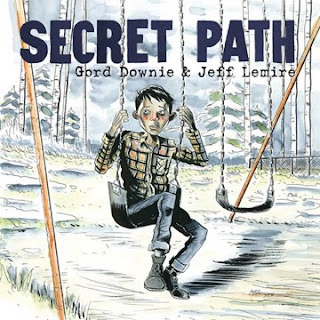 The Secret Path was created, written, direction, and composed by Gord Downie, with illustrations by Jeff Lemire. The film is executive produced by Mike Downie, Patrick Downie, Gord Downie, and Sarah Polley. Jocelyn Hamilton is executive producer for eOne Television and Stuart Coxe is executive producer for Antica Productions. Justin Stephenson is director of animation. The broadcast date marks the fiftieth anniversary of the morning Chanie’s body was found frozen beside the railroad tracks only twelve miles into his journey. 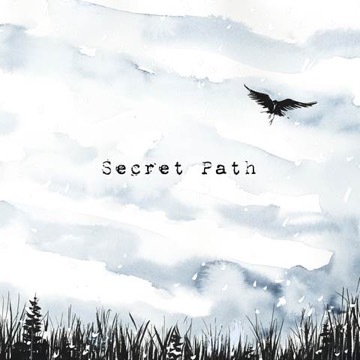 Proceeds from Secret Path will be donated to The Gord Downie Secret Path Fund for Truth and Reconciliation via The National Centre for Truth and Reconciliation (NCTR) at The University of Manitoba. The NCTR is dedicated to preserving the history of the residential schools in Canada, making this history known, and moving our country forward on the path of reconciliation. Secret Path acknowledges a dark part of Canada’s history – the long-supressed mistreatment of Indigenous children and families by the residential school system – with the hope of starting our country on a road to reconciliation. Every year as we remember Chanie Wenjack, the hope for Secret Path is that it educates all Canadians young and old on this omitted part of our history, urging our entire nation to play an active role in the preservation of Indigenous lives and culture in Canada. I first met Gord Downie and his brother Mike back in the winter of 2014. They wanted to discuss a potential project and, over coffee, they told me the story of Chanie “Charlie” Wenjack. Gord was then in the final stages of recording his incredible songs based on Chanie’s life and he shared the rough mixes with me in the hopes that I would be interested in creating a graphic novel to accompany his album. Before we left the coffee shop I knew I was going to do it. I had to. Chanie’s story is one that will not let you go once you hear it. It’s a story that can’t be ignored. And yet, somehow, it has been ignored. By nearly all of us. Growing up white in Southern Ontario, I never learned about Chanie Wenjack or about any of the tens of thousands of other indigenous children like him who were part of Canada’s residential school system. This is such a massive part of our country’s history, yet our schools didn’t teach us about it. Why? Maybe because it’s easier to live with ourselves if we pretend stories like Chanie’s never happened. But they did happen, and still happen. Chanie Wenjack lived and died, and no one knows his story. I’ve spent the last three years living with Chanie’s story and living inside Gord’s music. Gord’s haunting songs introduced me to Chanie Wenjack. Music is universal. It crosses languages and cultures and speaks to everyone, and I’ve always felt the medium of comics could do the same. It’s our hope that one day Secret Path will be taught in schools and that it will help to shed a light on this all too often ignored part of Canada’s past. I think, above all else, that’s what Gord and I wanted to create: something that can’t be ignored. Every Canadian should know Chanie Wenjack’s name and I hope Secret Path helps to make that a reality. my weekly work schedule and my working methods for both writing and for drawing. written by Scott Snyder, an exclusive page from which is featured above!). The first thing I would say is that I am probably doing too much stuff right now. new opportunities to work with artist and characters that inspire you. wake up early and draw all day before going back to restaurant for my next shift. work as a cartoonist and writer now. most happy are making comics and spending time with my wife and son. So that's basically ALL I do. And I'm happier for it. I work Monday to Friday at my studio from about 7:30 am to 4:30 pm. (pics of my studio here. Notice my origibal art collection on the walls. Constant inspiration). write 4 scripts a month and draw and paint aprox- 24-pages of comics. only 10 or so writing. on a script. This allows me to draw the equivalent of a monthly book in about 4 weeks. #2 Windsor Newton Sable brush. When the inks dry I watercolour right over the inks and then scan it all in. 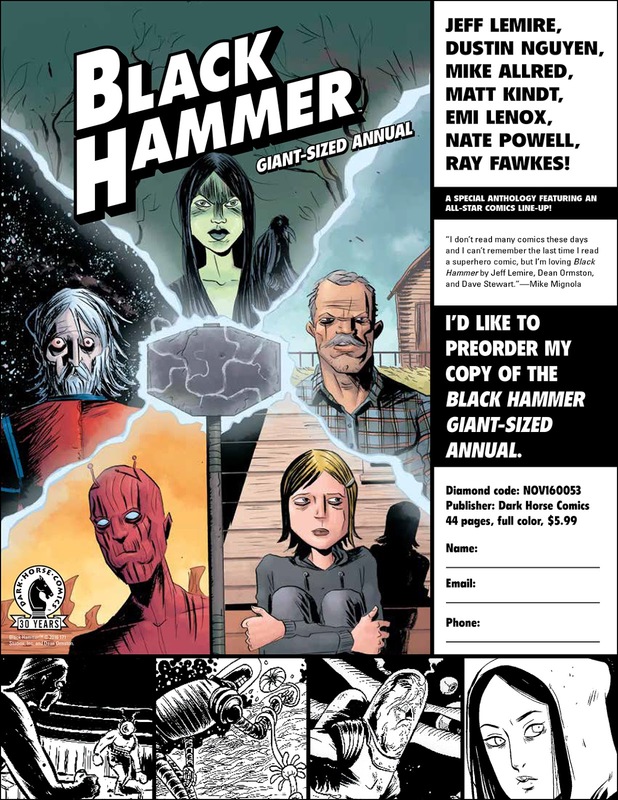 Thanos, 6 months ahead on Descender and 6 months ahead on Black Hammer. so I'll flip back to the other four titles for a while. week of the month. And I plan ahead for what's coming in the next two months. On the right is the list of all the current titles I'm working on. The scripts themselves are fairly quick to write once you have the plots done. I can easily manage a script a week in my "extra time" on weekends and at night. I keep for each series with all my issue by issue plots and future story ideas. It's hard to go into detail on my writing process, because so much of it is intuitive. But I do write full scripts, and try to keep the art direction to the bare minimum. as much of themselves into as possible and do their best work without feeling restricted. well as an excerpt from the outlines for that same issue from my "Series Bible". Green Arrow and now Logan, so we have a great chemistry. for granted and I do as much as I can every day. I've been doing for he last couple of years. AD: AFTER DEATH & ROUGHNECK RELEASE DATES! After a bit of juggling, the release dates for both of my next 2 graphic novels. 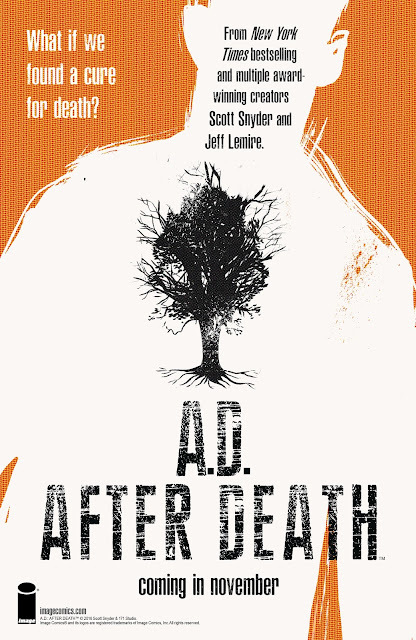 AD: AFTER DEATH, (written by Scott Snyder) from Image Comics and ROUGHNECK from Simon and Schuster are now set. Due to its increased scope and size, Scott and I have decided to expand AD:AFTER into three 72-page PRESTIGE FORMAT VOLUMES that will be published monthly! BOOK 1 WILL BE PUBLISHED THIS NOVEMBER! What if we found a cure for death? Two of comics most acclaimed creators, SCOTT SNYDER (WYTCHES, Batman, American Vampire) and JEFF LEMIRE (DESCENDER, Moon Knight, Sweet Tooth) unite to create a three part epic like no other, set in a future where a genetic cure for death has been found. Years after the discovery, one man starts to question everything, leading him on a mind-bending journey that will bring him face-to-face with his past and his own mortality. 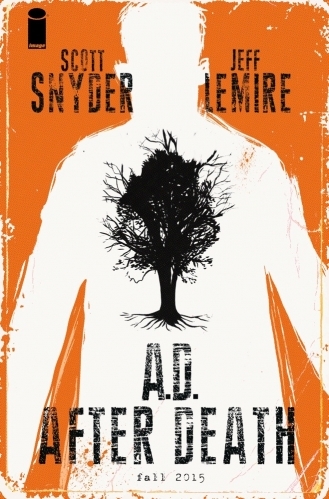 A unique combination of comics, prose, and illustration, A.D.: AFTER DEATH will be serialized monthly as three, oversized prestige format books written by Snyder and fully pained by Lemire. What if we found a cure for death? Two of comics most acclaimed creators, SCOTT SNYDER (WYTCHES, Batman, American Vampire) and JEFF LEMIRE (DESCENDER, Moon Knight, Sweet Tooth) unite to create a three part epic like nothing you've seen in comics. Set in a future where a genetic cure for death has been found, one man starts to question everything, leading him on a mind-bending journey that will bring him face-to-face with his past and his own mortality. 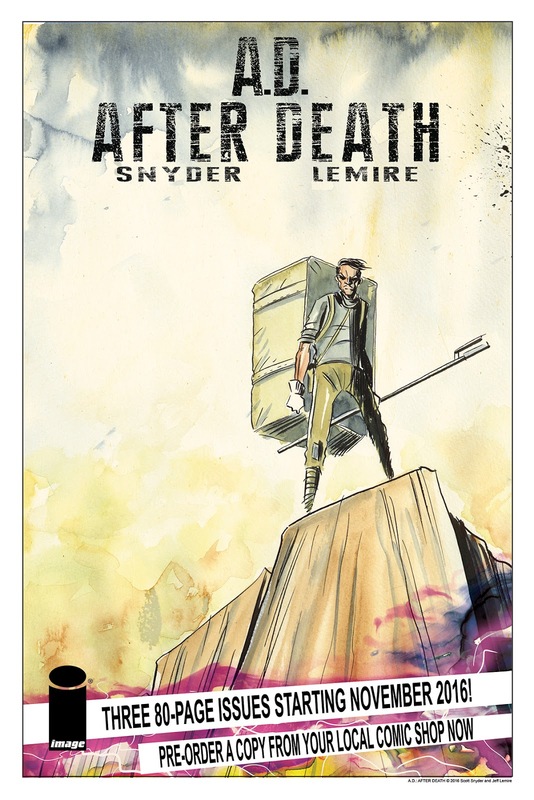 A unique combination of comics, prose, and illustration, A.D.: AFTER DEATH will be serialized monthly as three, oversized prestige format books written by Snyder and fully painted by Lemire.